What’s going on with Designated Survivor? The freshman ABC series will return in March but with a new showrunner, says The Hollywood Reporter. The political thriller stars Kiefer Sutherland as Tom Kirkman, a low-level cabinet member who becomes President of the United States after an attack on Washington DC. The cast also includes Natascha McElhone, Adan Canto, Italia Ricci, LaMonica Garrett, Tanner Buchanan, Kal Penn, and Maggie Q. In December, the showrunner of Designated Survivor was replaced for the second time. First, Jon Harmon Feldman took over for Amy Harris. And now, Army Wives veteran Jeff Melvoin will be showrunner. However, despite the changes, the series is still performing fairly well in the ratings. So far, Designated Survivor is earning an average rating of 1.45 in the 18-49 demo with 6.59 million viewers. The real test will come when we see how many viewers remember to tune in when the series returns. Season one of Designated Survivor returns on ABC on March 8th at 10 p.m. ET/PT. What do you think? Are you watching Designated Survivor? Do you hope ABC renews the series for a second season? 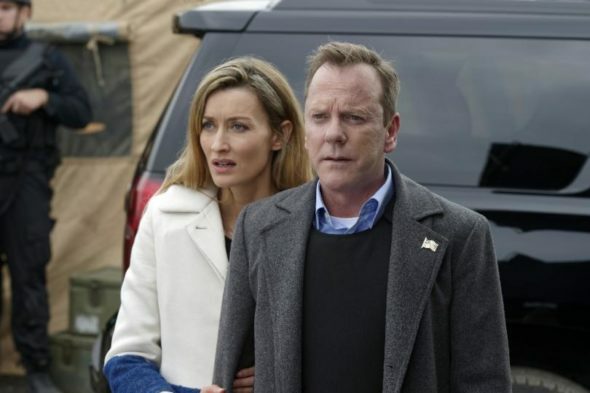 Designated Survivor: Season Two Renewal Coming for ABC TV Show? Designated Survivor: Cancel or Keep the New ABC Series? I’m thrilled Designated Survivor will return on March 8, 2019. I have the date on my calendar and am anxiously awaiting the first episode. I LOVE THIS PROGRAM! Can’t wait for show to come back!! Enjoyed it immensely!!! This was an excellent show. Can’t wait to see more of it. This was an excellent show, I loved it and have watched reruns whenever they are available. This by far was the best show they ever had. DO NOT understand WHY it is not a regular to return each season. INSTEAD they leave “the view” on and it is the worst show on tv. I thoroughly enjoy the show! I’ve been waiting for it to return. I’m disappointed that two characters are missing. The president’s wife is dead and there’s no mention of the older daughter. Please keep it on air. I agree. This is a GREAT SHOW! Not sure what ABC doesn’t get. Bring them all back. Keifer Sutherland has done a GREAT job giving us a production similar to the former West Wing!! YES YES YES, this is the most realistic and exciting series we have had the pleasure to enjoy. One problem….wish it ran all year, its seems like when it returns in March, its so darn long away, BUT well worth the wait. NO, other show could take it’s place.